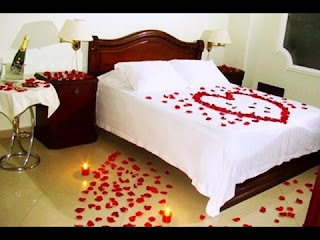 To celebrate, in a romantic way, this Valentine's Day, nothing better than surprise that special person with a bedroom decorated for this date, it does not matter if it is at home or if you prefer to rent it elsewhere, the idea is to make it an unforgettable experience. If you do not have many ideas, here there are some that will surprise you, not only because the final result is excellent, but because they are very simple to make. 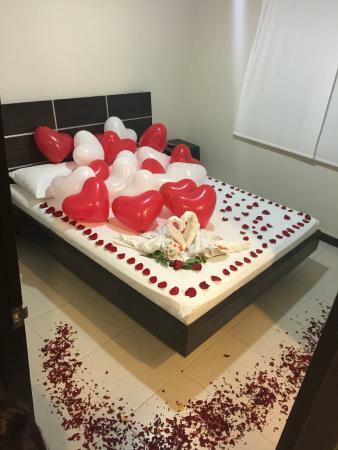 We have the presence of two white swans forming a heart, red roses in front of them and a large heart outlined with red petals, all perfectly complemented by a series of red heart-shaped balloons on the bed. 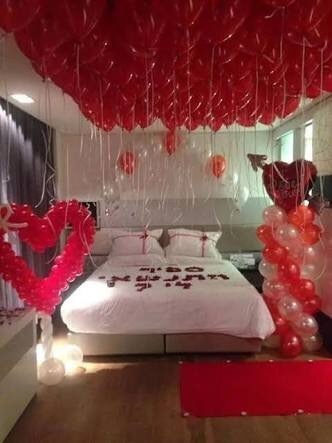 Beautiful idea, red balloons with white ribbons hanging on the bed, some ornaments with red and white balloons and the message you want to share, on the bed. 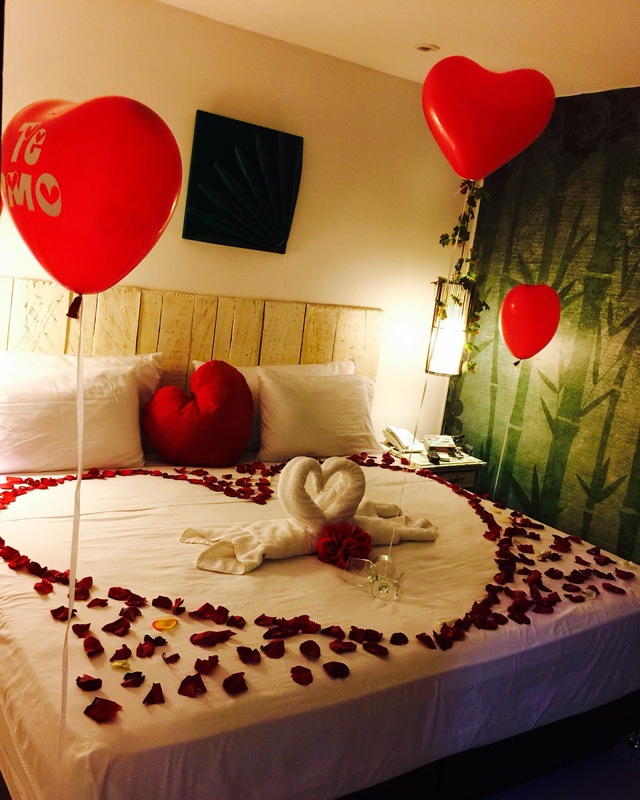 Romantic proposal, it is a pair of teddy bears, very well dressed, and a heart with white and red petals. 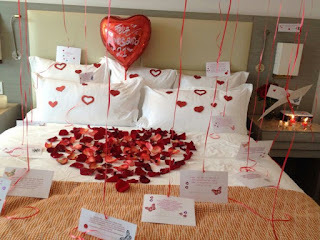 The most interesting details in this idea, are the romantic messages around the heart of petals that we can see on the bed. 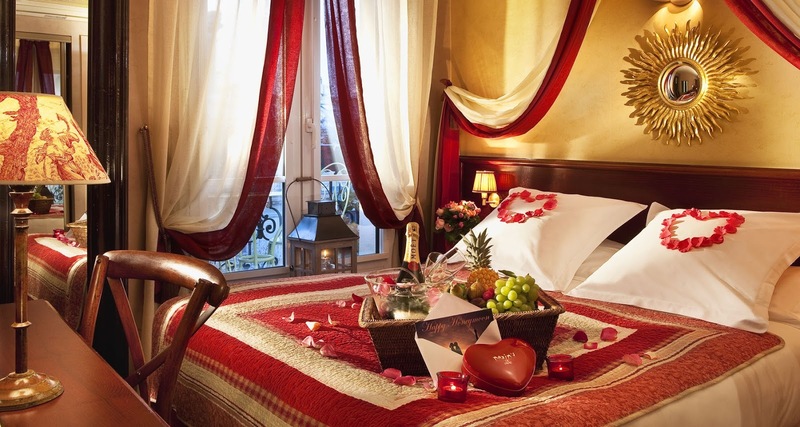 If your special person and you enjoy fruit and its aphrodisiac effects, nothing better than a basket full of fruit, a bottle of champagne and a couple of hearts on the pillows. 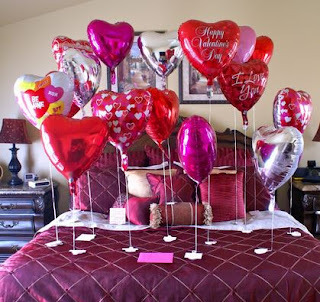 Imagine how surprised will be the person you love when he or she enters to the bedroom and find the bed with balloons of different sizes and colors, all in the shape of a heart, and as if that was not enough, each one with a romantic message in the base. 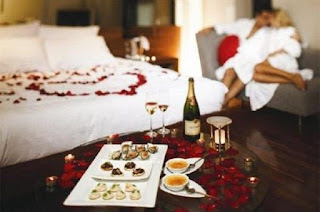 This is other interesting idea, besides the outlined heart with red petals, others on the tables, around the bottle of champagne and some other ones on the floor, we have red candles. 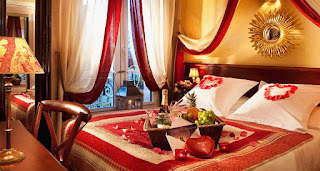 Do not forget that the perfect complement to a decorated room for Valentine's Day, are the drinks and snacks, choose those that you and your special person prefer. 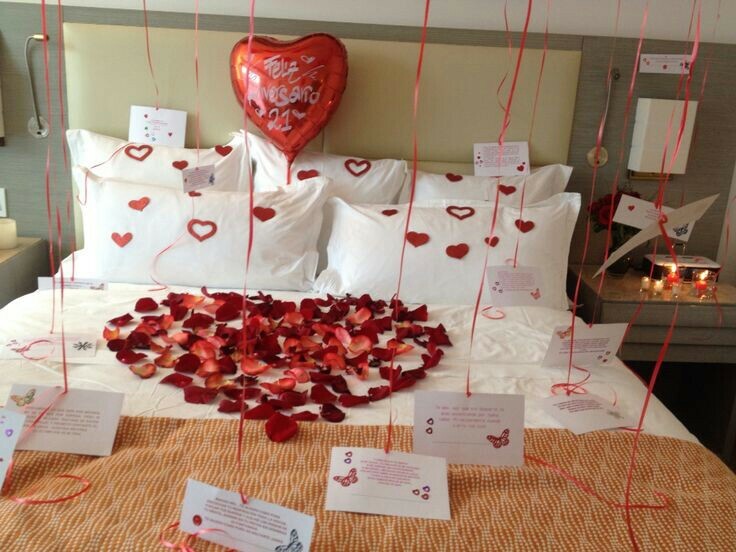 In this image there is not only a decorated bed with white swans, red rose petals and white and red heart-shaped balloons, but a kind of path with petals on the floor. 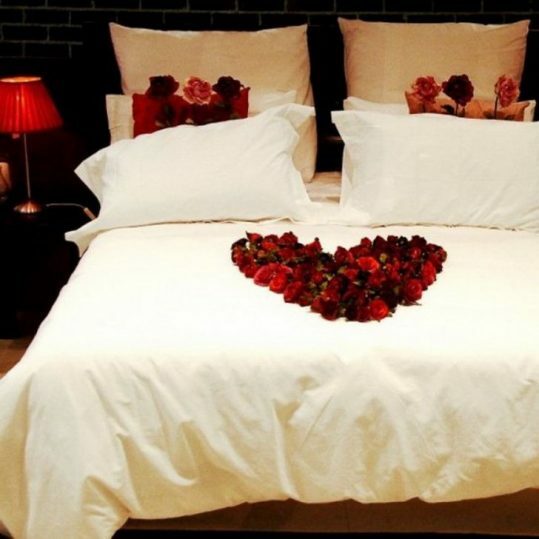 This is an elegant decoration, we have a big heart of roses on the bed and on the pillows, two groups of three roses.